The "3000" class is the main workhorse of suburban passenger operations in Adelaide. Similar to Melbourne's Comeng, the 3s main difference is that they are diesel-electric. There are two variants: 30xx, featurning a cab at each end , and 31xx with one cab. 30s can run single, while 31s run in sets of at least two and up to five. 30s can also be found running multiple at times. A combined power lever is used, with approximately 4 power notches and 5 braking notches. 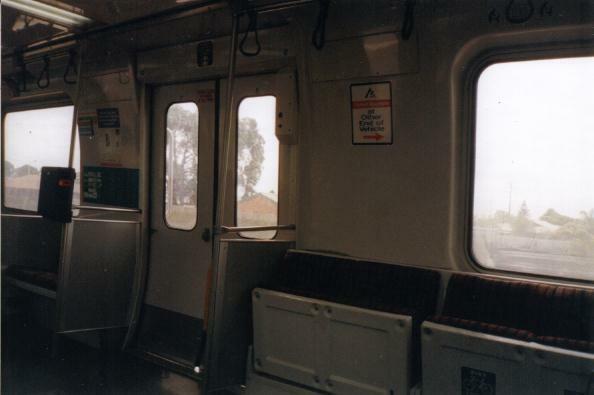 The lever is interlocked with the doors, the train will not move until the doors are closed. The trains are equipped with cab-signalling. A sound is made when passing signals. For green signals it is a "ding". All other signals (yellow, flashing yellow, red, green with turnout) produce a beep that seems to keep going until acknowledged by the driver. The horn is activated by pushing sideways. Most drivers push left during the day. The horn is used before departing stations, as well as near level crossings and other places required. 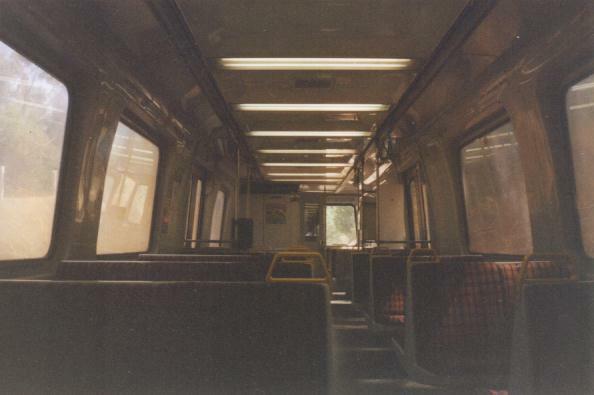 The cabin is offset to the left of the train facing outwards. On the opposide side is a seat for two, which is for staff when the cab is occupied. Cabins are accessed via the interior. Two doors separate the cab from the passengers. When in the middle of a consist, the double-seat is accessible, but the direct cab door is locked. When in use, the opposite takes place, with the driver's door latched open and the door to the passengers locked. Cabins are activated by key. Activation switches off the ceiling lights in the cab (to reduce glare at night) and activates the guages. As driver-only operation is common, door buttons are in the driver's cab, as well as microphone and switch for announcing stations. For large sets, a PSA (guard) assists from the last car, using a panel next to the door. Drivers can watch boarding activity via mirrors and a closed-circuit TV. The trains feature diesel generators that sit on a constant RPM. Under load they produce a bit more vibration and noise, but do not change pitch. Also the air conditioning fan will slightly fluctuate when the unit is accelerating, which suggests there is no dedicated HEP unit. The mechanics all sit under the car, except for radiators which are on the roof. The 3's do not blow black smoke, unlike the 2s which emit a plume when accelerating. The bogies are stamped with "Comeng". They have air bags. Most, if not all units feature electro-magnetic brakes between the wheels of one bogie (but not the other). This is operated seperately to the main brakes. The brake gauge puzzles me, what seems to be the cylinder pressure gauge will sometimes be on zero while slowing down, sometimes it will rise and then slowly fall back to zero while braking remains constant. It also seems to be delayed at times. Trains are equipped with auto couplers. Buttons are in the driver's cabs. Coupling is sometimes done in Adelaide station, requiring an extra staff member to flag the driver as well as connecting air hoses and safety chains. This feature adds to the versatility that allows anything from single (3000) unit operation to multiple unit operation of up to five, six and possibly more cars. Many other suburban trains do not offer such flexability. Headlights are mounted at the top of the car, two lights in the centre. There are no marker lights at the front (I think there should be), however there are red marker lights for the rear. There are metal steps up the side of the car to each door. Small lights illuminate these steps. There are four enterances with two sliding doors each. Doors are individually numbered with odds on one side and evens on the other. After release by the driver or PSA, passengers manually slide doors open with the handle. Doors close automatically after a warning chime starts sounding. Doors can be overridden by PSAs who often hang out the door as the train drives away. A RCD-protected 240 volt style power outlet was observed in car 3023 at the A-end under the seat near door 7. Note that many railcars have survelance equipment installed, which helps catch vandals. 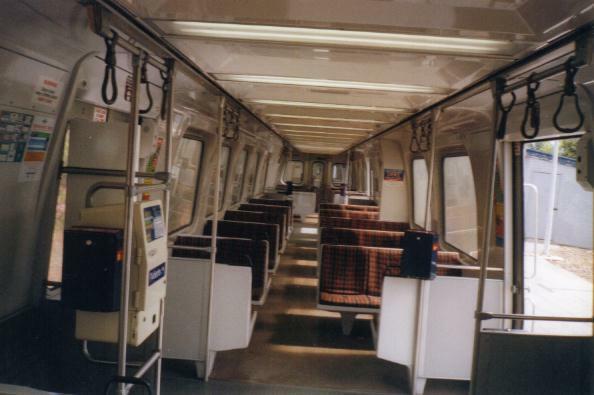 Seats are generally arranged facing each other, in 2+isle+3 configuration, however near the doors seats face across the train. All of these are special purpose seats, reserved for elderly or handicapped while some fold up for bikes and wheelchairs. Wheel chair ramps are locked in a white box near a door. All cars are air conditioned, the return being at the end of the cars (not near the doors). Windows are double-glazed which helps maintain the temperature. Flooring varies between carpet and two styles of solid flooring - one with round tactile bumps. Some cars have been refurbished and feature yellow grab handles for vision-impared passengers as well as new flooring and better windows. A refurbished car. The flooring is solid and has a pleasant speckled appearance. Windows are easier to see through, and seats are clean. Older-style furnishing with carpet, which shows the spills and chewy. Also on the left is a ticket vending machine (cream) and validator (blue). Behind them is the portable wheelchair ramp (white cabinet). All railcars have an emergency brake, the penalty for missuse ($500) seems effective. 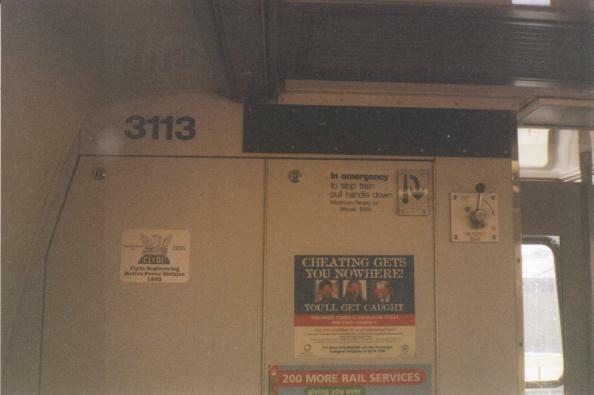 This railcar was built in 1993 by Clyde. Only a few railcars have this plate. The other stickers show the fines for fare evasion ($$$) and advertise the increase of services on the Gawler and Noarlunga lines (more 15 minute running). The driver's cab is behind this wall, to the right is the door.